Tropical Storm Vicente made landfall and weakened quickly to a tropical depression on Oct. 23. 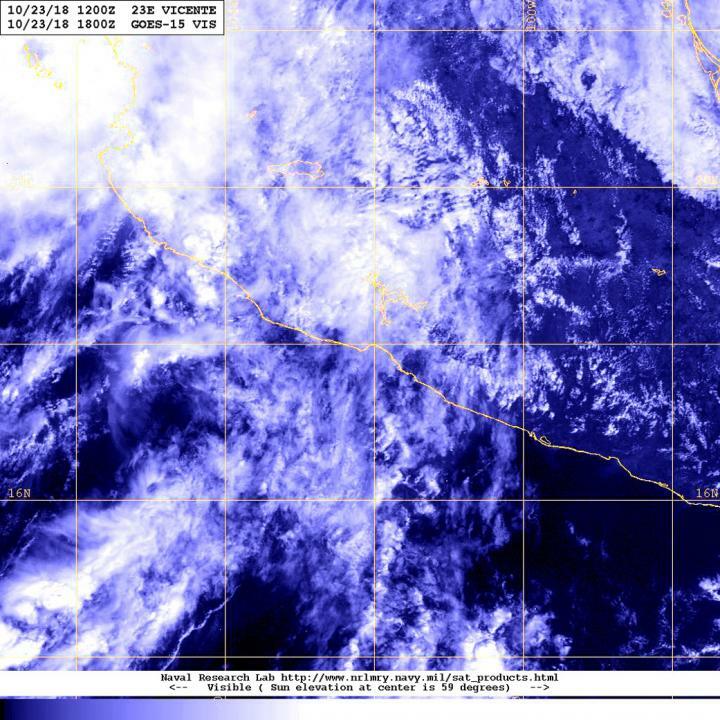 NOAA's GOES-West satellite captured a visible image of the fading, and now post-tropical storm raining on southwestern Mexico. On Oct. 23 at 2 p.m. EDT (1800 UTC), NOAA's GOES-West satellite provided a visible image of Vicente. The storm appeared almost shapeless, but there was a larger concentration of thunderstorms near its circulation center. Vicente degenerated into a remnant low while moving inland over the Mexican state of Michoacan. At 11 a.m. EDT (1500 UTC), the center of Post-Tropical Cyclone Vicente was located near latitude 18.4 degrees north, longitude 102.4 degrees west. The post-tropical cyclone is moving toward the north-northwest near 12 mph (19 kph) and this general motion is expected to continue today, bringing the system farther inland over Mexico. Maximum sustained winds have decreased to near 30 mph (45 kph) with higher gusts. The system is expected to dissipate later today. The estimated minimum central pressure is 1008 millibars. Despite weakening, the NHC cautioned that Vicente's remnants are expected to produce 3 to 6 inches of rain with local amounts to 10 inches through today, Oct. 23, over portions of Guerrero, Michoacan, Colima, and Jalisco in Mexico. This rainfall could produce life-threatening flash flooding and landslides within mountainous terrain.